These are not new themes to readers familiar with Taylor’s novels, nor are they uncharacteristic of the genre of ars poetica within which she positions A View of the Harbour’s considerations of the interaction between art and life, fiction and truth, intimacy and betrayal, and the myriad masks we all wear in our dealings with others — but especially with ourselves. 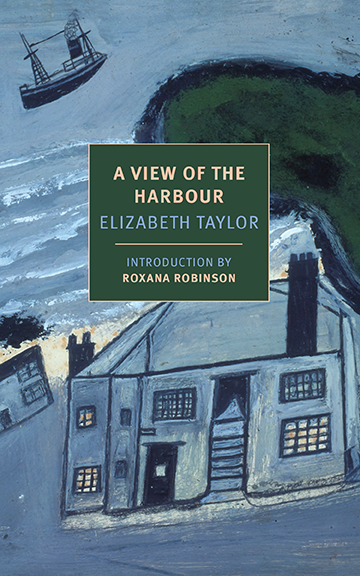 A View of the Harbour takes on similar thematic concerns to A Wreath of Roses (1949), Taylor’s undeniable masterpiece alongside the posthumously published Blaming (1976), while casting a much wider net. 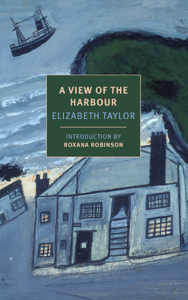 Indeed, it is likely the most populated of Taylor’s novels in terms of main characters: whereas Wreath focuses on more than the two or three primary protagonists that feature in most of her novels (Wreath begins with three, and then extends to finally encompass six), Harbour extends further to embrace the intersecting lives of a whole seaside town in thrall to the past. The first chapter of Harbour alone is conducted with enviable skill. Here, with impressive strokes, Taylor paints — almost literally — the portrait of an English town still shaking off the weight of the Second World War (“there had been a war on”) in a symphonic register so that when one finishes the first chapter, one feels that one has not only been introduced to all of the main players in a large chamber piece, but that one has heard the orchestra tuning up in the pit below. While each individual is dealing alone with his or her own demons, the ways in which the individual’s attempts to move past (or succumb to) his or her very singular battles coincide with and brush up against the other members of the community is Taylor’s primary focus in this novel. For how can we dwell alone, seeking truth or insight about our highly individualized brand of chaos, when we are continually brought up against the chaoses others house within them? How can we ever really know just what is our own predicament when our lives are so inextricably entwined with those with whom we surround ourselves, whether wittingly or unwittingly? In many ways, Harbour is a synthesis of To the Lighthouse as well as The Waves (1931), harking back to Woolf’s work while forging ahead with its own unique voice, its own rhythms, pulsations, and nuances. Because Taylor is sadly overlooked — and has only recently begun to be considered on her own terms — it is perhaps too easy to draw stylistic comparisons to the likes of Jane Austen, Elizabeth Bowen, Barbara Pym, Rose Macaulay, along with Woolf. However, to say that Taylor writes like Woolf or any of these other figures would do a critical disservice to her remarkable prose style as well as the bleak but always humane visions of life offered in her fiction. With that said, the critical parallels to Woolf’s work — e.g., the similarities in structure but not treatment in both Harbour and To the Lighthouse, the echo of six characters’ quests for self-knowledge in The Waves as at least a starting paradigm for Taylor’s A Wreath of Roses — are certainly present in Taylor’s, but more as an homage, a mid-century departure from Woolf’s pioneering modernist prose. While Taylor’s themes mirror Woolf’s, her treatment argues that new kinds of fiction and new modes of storytelling are needed for post-war Britain, especially in considering family ties, domestic intimacy, and how the social always informs the personal. Similarly, the large cast of characters in Taylor’s novel are grappling with their respective pasts, but in less fictively and psychologically productive ways than Woolf’s feat above. One of the major problems with comparing Taylor’s work to that of someone like Austen is belied by Taylor’s tone: while Taylor makes great use of free indirect discourse, satire, and irony like Austen, and while her focus is on the same social class (the educated bourgeoisie), Taylor’s prose is much darker than Austen’s. While she makes great use of comedy, critical comparisons to Austen serve as severe detriments to Taylor’s much bleaker outlook on life, as well as her revisions of Freudian models of individual psychology. Harriet and Vesey’s childhood love in A Game of Hide and Seek (1951), for example, does serve as social commentary in an Austenian sense, but the theme of love causes Game to ruminate obsessively about betrayal, infidelity, and intense pathos rather than gush poetically about the power of lifelong devotion. As Tory phrases it in Harbour: “the course of true love never does run smooth.” All of Taylor’s characters are in states of deep pathos; but only a few of them are ever granted full reprieve from it. this formidable ancient enemy of hers — this other thing, this truth, this reality . . . before she exchanged the fluidity of life for the concentration of painting. . . . Certainly she was losing consciousness of outer things. And as she lost consciousness of outer things, and her name and her personality and her appearance, and whether Mr. Carmichael was there or not, her mind kept throwing up from its depths, scenes, and names, and sayings, and memories and ideas, like a fountain spurting over that glaring, hideously difficult white space, while she modelled it with greens and blues. “I am a painter,” he suddenly said to Tory, who had been thinking of her husband. “A real painter?” she asked, looking up. That was the question. All at once he felt like telling her the truth as he glimpsed it at that moment, that he was not a painter and never would be, that he would have no immortality, leave nothing to linger after him, had no hope of greatness, day-dreamed merely, frittered time away, let curiosity beguile him. But he could not bear the truth, even for a second, not for himself, still less to share. “The artfulness of men,” she thought. “They implant in us, foster in us, instincts which it is to their advantage for us to have, and which, in the end, we feel shame at not possessing.” She opened her eyes and glared with scorn at a middle-aged man reading a newspaper. In Taylor’s world, everyone deals not only with their own existential crises, but with those questions that plague those whom they encounter in daily life. What makes Beth’s predicament or Bertram’s paralysis singular, individual? What distinguishes their pursuits from the voyeuristic ones of the envious Mrs. Brace, who condemns the world into which she can no longer venture while at the same time lamenting the fact that she is no longer a part of it? In what ways are we all guilty of affecting the grief, the violence, the happiness of those in our various communities or those with whom we live? K. Thomas Kahn‘s work has appeared in the Los Angeles Review of Books, The Millions, The Quarterly Conversation, Music & Literature, Open Letters Monthly, Berfrois, Bookslut, Numéro Cinq, and other venues. He is Reviews Editor for 3:AM Magazine and Words without Borders.